Watch the paintings grow from the beginning. I created Process to document various projects from the beginning, with the hope of shedding some light on the origins of the ideas. I begin with my basic tools-my heart, my mind, my eyes, my hands, a can of paint, and a brush. In the same way that music sometimes springs from an initial idea that may only be a few notes, a painting or sculpture can develop from just a few lines, colors, shapes, or ideas. Artisan Works, Rochester, New York Louis Perticone, director and creator of Artisan Works, gave me the wall space for the mural. I wanted to create something as a remembrance for a friend who had recently passed away, one of the sweetest and most loving people I had ever known. Once I began drawing, it felt like the mural was creating itself. Louis had only one request, that I keep the no parking sign(toward the right) intact. Beginning March 21, 2010, watch a step by step creation of this, the third painting of the Casablanca Trilogy. What music was I listening to? 3.27.10 The music I was listening to is Ok Go, the album "Of the Blue Colour of the Sky"-Great Album! And check out the Rube Goldberg video for "This Too Shall Pass" on the Ok Go web site at www.okgo.net You'll be glad you did. 3.31.10 Freezing in the Studio! 4.12.10-Shortly after this I got a call that my mother had fallen and broken her hip. 5.4.10 After returning from my mother's almost three weeks later. Springtime! At the "Museum" was Robert Overacker's damaged jetski from his 1995 attempt to ride over the edge of Horseshoe Falls and parachute to the bottom, to help promote awareness of the homeless. 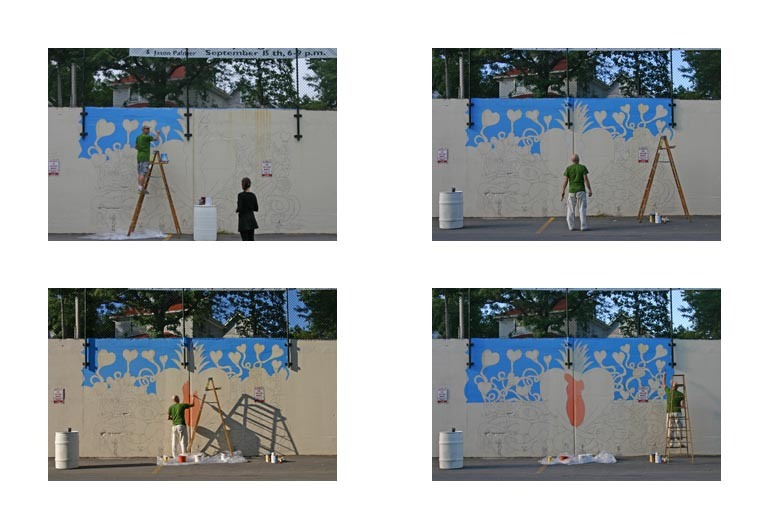 In November of 2008 I showed a few paintings from the Remembrance series at the Rochester Contemporary Art Center. To announce the show I made 300 hand painted cards, below left and right. The cards are 4 x 6 inches. The paintings-one is shown below center-are 8 feet by 8 feet. The drawings on the cards were based on the original sketch for the series of paintings, which can be seen at the ATDE Archive page. I had stopped at WBER, Rochester's famous alternative radio station, and gave one of the cards to Joey Guisto*. He seemed to be startled by the simplicity of the card and made a comment about it. This motivated me to create this Process page, to shed a little light on the creative process from the beginning. It is easy to hear how four simple notes might develop into Beethoven's Fifth Symphony, or a Ramone's tune, but I guess some people have a more difficult time making the jump when it comes to visual things. Here's a chance to improve your cultural literacy! All these abstract images have roots in reality, in our contemporary culture, in music, literature, and much, much more. 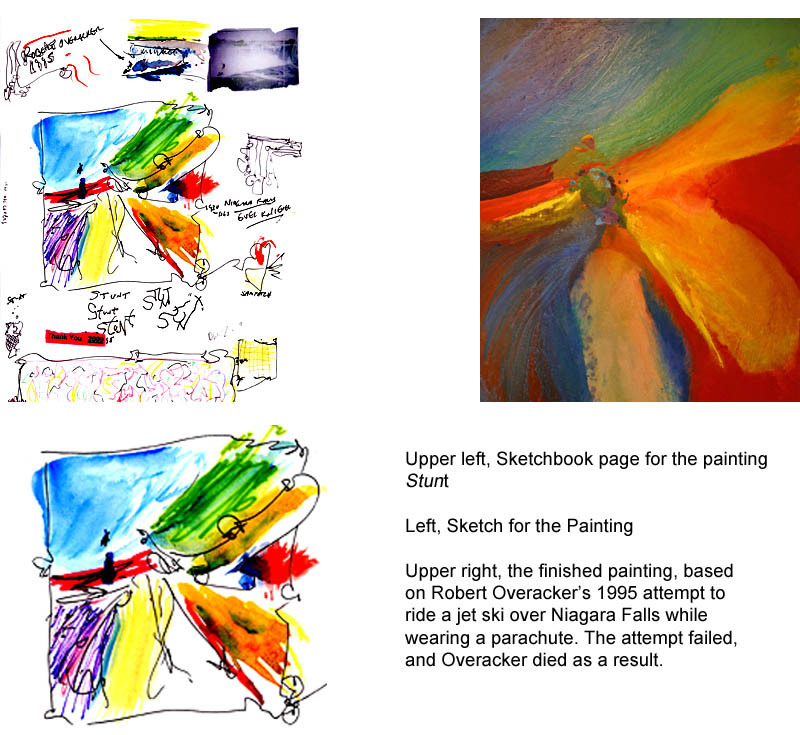 For example, if I told you that the painting above is based on Niagara Falls, and is also a metaphor for our life journey, which seems to end-or make a pit stop-in a seemingly infinite abyss, would it add to your enjoyment of the paintings? When you see something you can recognize, just follow the thread-it's like a puzzle.